That was how my friend described this cake because of its distinct recognizable colours. 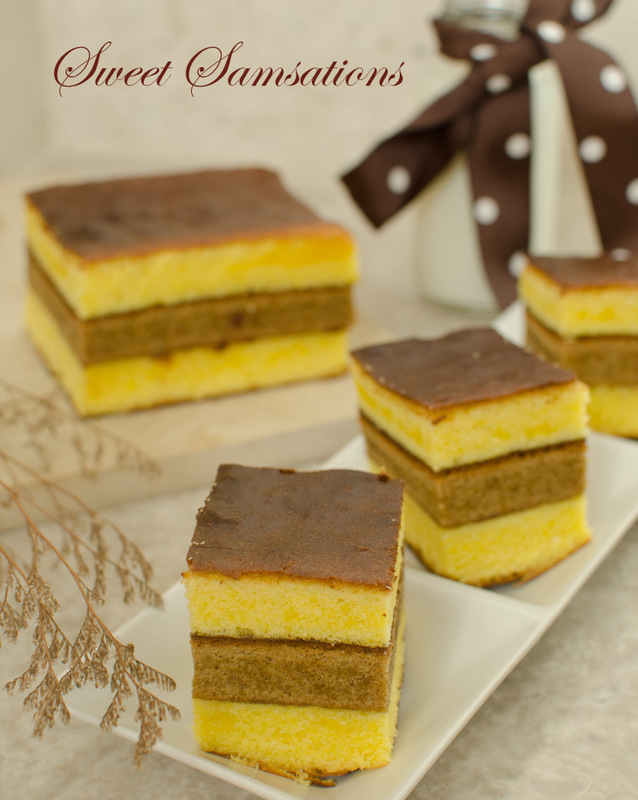 Kue Lapis Surabaya, also known as Spiku, is another classic Indonesian layered cake that is a lot easier to make than Lapis Legit. 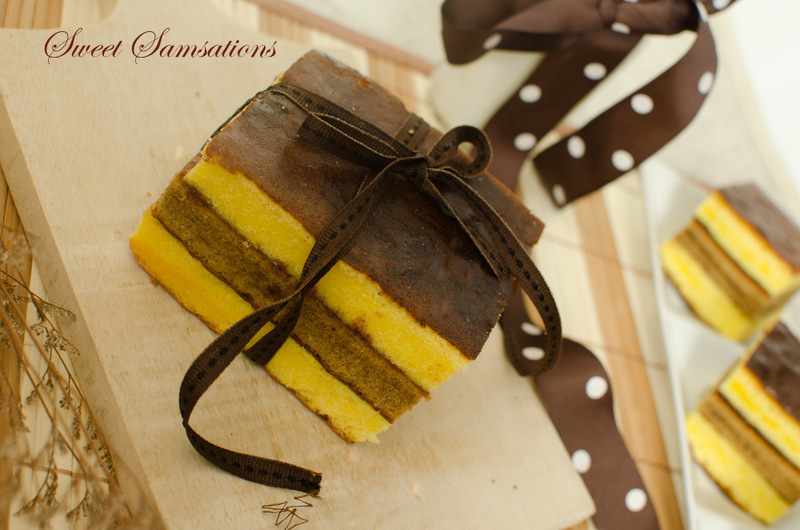 Named after the city, Surabaya, this cake is almost just as popular but more affordably priced. Like many other Indonesian cakes, Lapis Surabaya also employs a ton of eggs. Baking powder and baking soda is not commonly used in traditional Indonesian cakes and therefore the beating of the eggs serve as the primary volumizing factor in attempt to achieve the fluffiest and softest cakes. 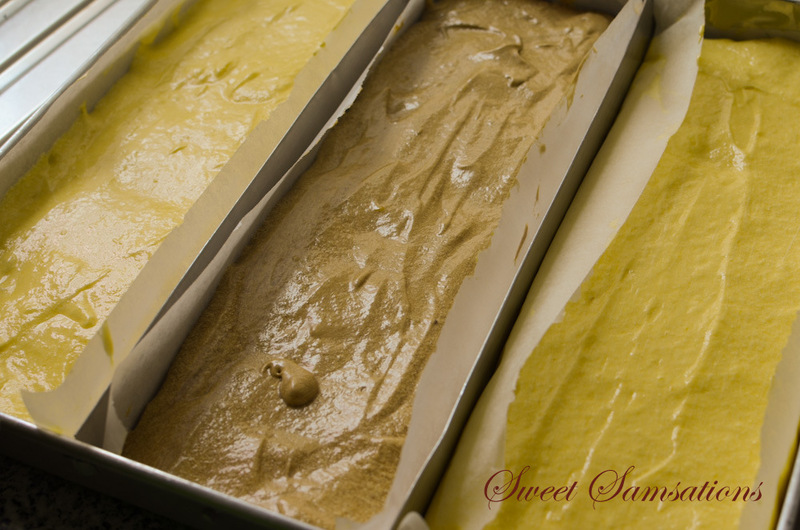 Many bakeries also use an emulsifier to exaggerate that softness. Anyway, while I was in Indonesia in December, I decided to take a one-day baking course with the Natural Cooking Club. I found their courses so reasonably priced! Approx US$30. (Compared to Singapore and Vancouver, where a 5-hour course would probably cost about $100 or more) Of course the downside is that the entire session is conducted in Bahasa Indonesia, so being able to speak some Indonesian would be helpful. Ms. Fatmah Bahalwan is a really experienced lady who has been teaching for over 12 years. Her cooking and baking books can also be found in Gramedia bookstores all over Indonesia. This was actually the first baking course I ever took! It was definitely an interesting experience as compared to consulting the internet and recipe books as I usually do. One of the cakes we baked during the course was Lapis Surabaya. Needless to say, it was my ultimate favourite amongst the rest! I knew I had to replicate it at home. This is an easy recipe. The important thing though, is that your eggs need to really be beaten until it triples in volume! Same goes with your butter too. Do make sure it turns pale white in colour and no longer has a trace of yellow in it. This is the full recipe with slight modifications. I halved the recipe to make an 8×4 inch cake (22×11). As you can see, the ingredients are very simple and basic. The eggs serve as the “liquid” portion and thus there is no water / milk in this recipe. Preheat the oven at 180 degrees and grease the pan. Beat the butter at high speed for about 10 minutes until it turns pale white in colour. Beat the egg yolks with sugar until pale and tripled in volume. When you lift the beaters it should form a ribbon. Pour the yolk mixture slowly into the butter mixture and fold in until fully combined. Be sure to scrape the sides of the bowl for any butter so the entire mixture is incorporated. Sift in the flour and fold. Careful not to overfold, as overmixing will result in a reduced volume of batter. Divide the mixture equally into 3 portions. For one portion, add cocoa powder / mocha paste and lightly fold. Bake in 3 separate pans for 20 minutes or until cake springs back when touched. Let the cake cool and spread strawberry jam between each layer. 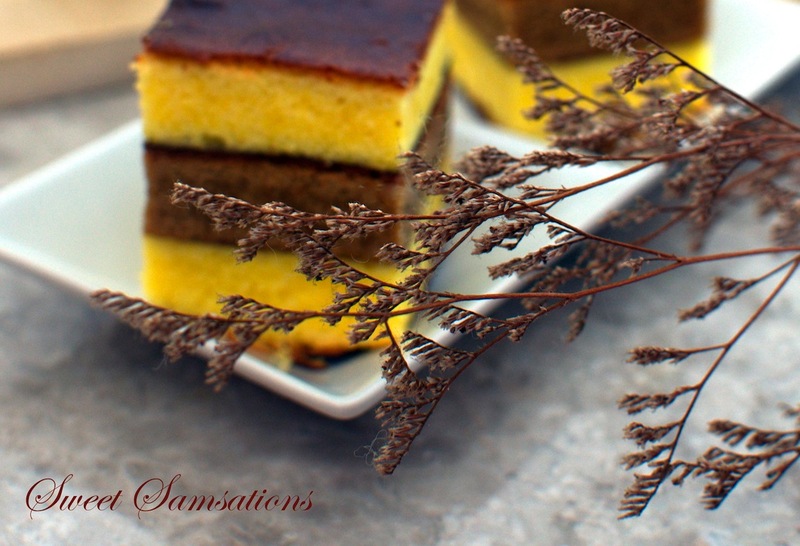 I am participating in Aspiring Bakers #27: Through Thick and Thin – Kue Lapis Classics that I’m hosting this month! 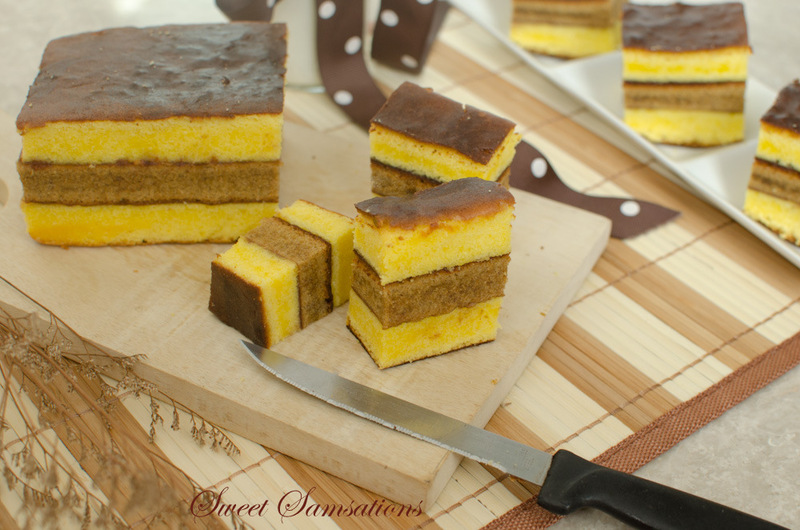 This is the “Thick” Kue Lapis. 😀 You can see the “Thin” one here. Mocha paste?! I didn’t know it existed and now I want to find some! Beautiful, as always, Sammie! What pretty layered sweet treats! THIRTY EGG YOLKS?!?! How big is the cake? This cake I can handle. It is on my to-make list. I am sitting down to breakfast and a big chunk this cake would be very satisfying with my coffee. I’ve been loving all of these layer cakes you’ve been featuring. This looks great – I love that it’s just the eggs giving it the volume. Whoa — that’s a lot of eggs. But well worth the eggy investment from the looks of this spectacular cake. What a spectacular layered dessert!!! You made it perfectly! What a lovely cake – the layers look perfect! What a lovely, gorgeous looking cake. So professional! Based on your description, I would just loooove the flavor, too. YUM! This cake is such a great combination of flavors! Amazing Sammie! The layered cake (any type!!) scares me and I haven’t even tackled yet. One day… this is so beautiful and I immediately fell in love! 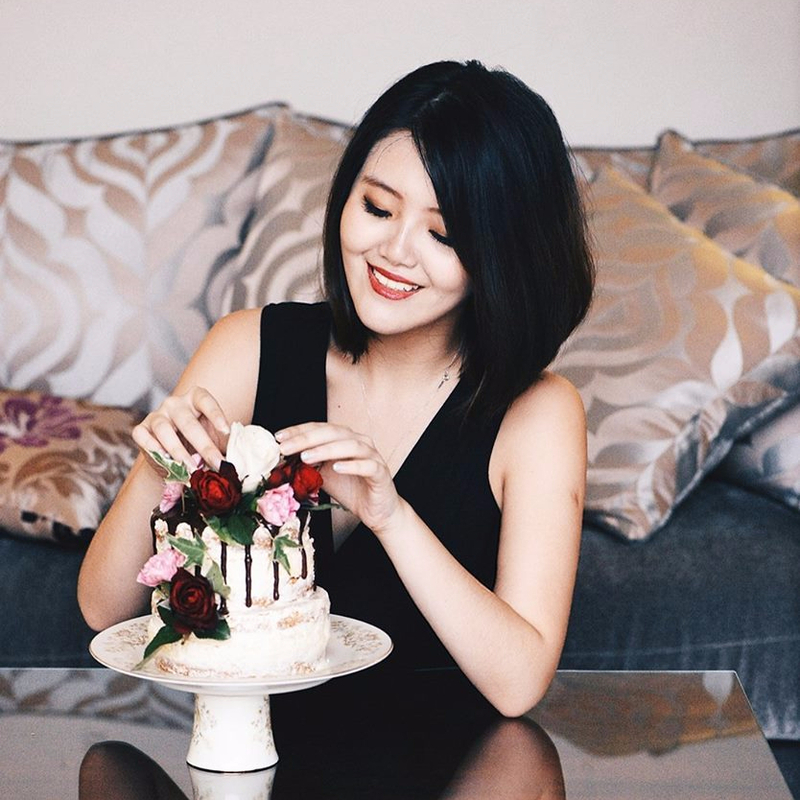 Wow Sammie, this cake looks delicious…love the layers…and it so pretty, very elegant. Thanks for sharing this. 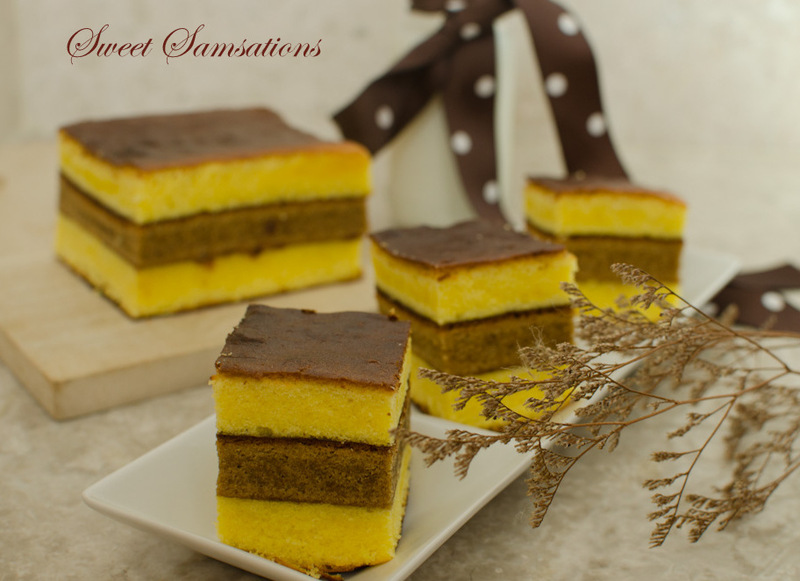 I am still thinking of whether I should make this… but after that 19 layer Kuih Lapis, I think I need a break from eggs and butter (too fattening!). Maybe next CNY? How adorable, I love how the cake is cut into dainty bites. It looks so moist and delicious. With all those eggs it must have a delicious rich flavor! I have a question, do you use unsalted butter for the butter? and is it margarine parkay/ imperial brand for the margarine? and is it room temperature for the butter and margarine? would you tell me how many cup for the butter and margarine instead of gram? do you use cake flour or all purpose flour? Hi there! I used unsalted butter for this and a generic brand of margarine. “Room temperature” really varies! Because room temperature in here is a lot higher than the room temperature there. If you’re in north america I would suggest room temperature, but if you’re in a humid country your butter should be cold. Just ensure that it is in solid form before you beat it because it needs to turn pale white. I would suggest 2 cups of butter and 1/2 cup margarine if you don’t have a scale. Samantha, terima kasih for posting the recipe. I’m also glad that I don’t need to use emulsifier, which is pretty challenging to find here. I’ll definitely make it, and let you know the result. Sharing makes more beauty. Thanks any way. Hi, can check did get your cake tin from, any address? Hi Sammie, I noticed there is no egg whites. Is this correct? ?